Coverage: Watch highlights of the first two days before live and uninterrupted coverage of the weekend's action on BBC Two and up to four live streams available online. Listen on BBC Radio 5 live and BBC Radio 5 live sports extra. Read live text commentary, analysis and social media on the BBC Sport website and the sport app. Full details here. Whenever Rory McIlroy's status as the world's most naturally gifted golfer is questioned, there is usually a swift reaction to remind us of his immense talent. The ingredients are there for something similar to happen at this week's Masters but the challenge is formidable with so many big names demonstrating top form so far this year. In 2011, McIlroy won the US Open by eight strokes in his first major since blowing that season's Masters. A year later, he suffered a string of missed cuts before winning his second major at the US PGA Championship. And in 2014 he had slipped out of the world's top 10 before embarking on a run that brought him the BMW PGA title at Wentworth and a high summer stretch that yielded the Open, Bridgestone Invitational and PGA crowns in consecutive weeks. Now he heads into the Masters having suffered an injury-blighted start to 2017 while Dustin Johnson has surged to the top of the world rankings. No longer is McIlroy unanimously regarded as golf's biggest talent. Johnson shows no weakness; he is powerful, long and straight and supplements those qualities with unerring deftness on and around the greens. Having lifted his first major title at last year's US Open, the tall American appears unflappable and is playing with a maturity that many thought was beyond him. In short, he looks the perfect golfer and having won his last three tournaments, the strongest events of the year to date, Johnson is the undisputed favourite for victory here at Augusta. But this is the sort of scenario that inspires the best in McIlroy, especially as he seeks the title he craves more than any other. A Masters Green Jacket would complete his set of major prizes. He says he would not be able to feel proper fulfilment if he never wins one. It is a lot of self-imposed pressure and explains ruinous nine-hole spells that have peppered and scarred so many of his Augusta attempts. And McIlroy accepts that each year that passes without landing the Masters makes the next attempt more difficult. He is only 27 but there is a raging impatience. Many observers have long held the belief that he is destined to win multiple Green Jackets. But the same was said of the likes of Ernie Els and Greg Norman, and both are still waiting. Norman was fourth on his debut in 1981, runner-up three times and third on three occasions. Listening to him speaking to BBC World Television recently, it was clear that he likes the Northern Irishman's chances of becoming only the sixth player to complete the career grand slam. "I'm a bit of a McIlroy fan. I like his moxie on the golf course - I like his style," said the 62-year-old Australian. And Norman is not concerned that McIlroy's season to date has been heavily disrupted by the fractured rib he suffered at the start of the year. After finishing second at the South African Open he did not return to action until coming seventh at last month's WGC Mexico Championship. Norman believes that was a tellingly impressive comeback because it was at altitude which makes distance control difficult. "To step away from the game as long as he did, to step back into the game and compete the way he did tells me he's got really good control of his golf swing," Norman said. 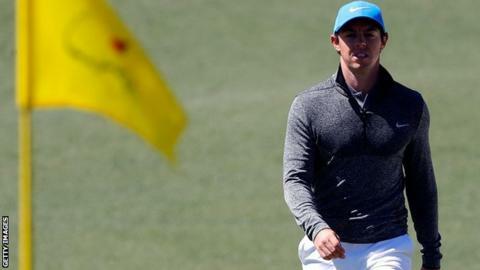 McIlroy followed up with a fourth place at the Arnold Palmer Invitational before playing only two matches of the group stages of the WGC Matchplay, a tournament that yielded Johnson's third straight win of the year. And while Norman agrees the big hitter from South Carolina is the front-runner at the 2017 Masters, he also suggests Johnson might prove vulnerable on Augusta's slick greens. "I do see one little glaring fault that happens under pressure with him," Norman said. "His putting stroke is excellent but at times it does have a tendency of breaking down just a little bit." The two-time Open winner refused to go into detail but revealed that he tries to help Johnson through the world number one's friendship with his son Gregory. "What pains me is when I see something on TV and I go, 'Oh my gosh, it's so glaringly obvious why he's missing those short putts'," Norman revealed. "So I'll text my son and I'll say 'next time you talk to DJ, just tell him to do this and give him that one piece of information'. If he does it, he does it - I don't know." But there is no doubting Norman's admiration for the overall Johnson package. "I'm really, really impressed with him," he said. "A combination of power, finesse, calmness beyond calm. Nothing seems to faze him. "He has been consistent for over a decade now, he's won a golf tournament every year for over a decade." To date, though, none of those have included the Masters where he has been sixth and fourth in the past two years. Johnson's preferred ball flight is a left-to-right fade whereas the popular belief is that players are better shaping it in the opposite direction at Augusta. "Because he can power the ball, he can play the Masters left to right rather than right to left," Norman said. "Jack Nicklaus used to play left to right and he'd got more Green Jackets than anyone else." Six-time winner Nicklaus is the ultimate Masters golfer but Jordan Spieth may, one day, prove a rival for that tag. The 2015 champion has played the event three times and has yet to finish outside the top two. Still only 23, he has banked $3.472m (£2.79m) from the Masters alone, although you would guess he would have traded most of that for a "mulligan" on the 12th tee last year. Dumping two balls into Rae's Creek on the shortest hole on the course led to a quadruple-bogey seven that put paid to what had been a five-stroke advantage on the front nine of his final round. Britain's Danny Willett then seized the moment to claim his first major title. Spieth returned to Augusta last December, played the hole twice and birdied it on each occasion - the second time from tap-in range. But the ghosts will take longer to be exorcised. "It's not as if it's going to be the last year he gets questions about it," McIlroy said. "I still get questioned about the back nine at Augusta in 2011," added McIlroy who came home in 43 in a round of 80 that ruined his four-stroke 54-hole lead. He is a far more experienced figure these days and spearheads a formidable UK contingent that includes 11 Englishmen, Scotland's Russell Knox and veteran former champions Sandy Lyle and Ian Woosnam. Victory brings a return ticket for life. Few, if any, crave it more than McIlroy and in a year when, so far, his leading contemporaries Johnson, Spieth, Justin Thomas, Rickie Fowler and Hideki Matsuyama have made all the noise, this might be the moment when the story becomes Rory.